This research project consists of an investigation of responses to homeless encampments on rights-of-way owned by Departments of Transportation (DOTs). While DOTs are not housing or social service agencies, their role as major public landowners involves them in dealing with the consequences of homelessness. The research goals included analyzing the prevalence of the problem, documenting how DOTs are responding, and culling from this data information that could be used as a basis for creating a best practices guide. The research included a single mixed-methods, in-depth case study, electronic surveys of practitioners and follow-up interviews. Products consist of two reports (included as appendices to this document): A Case Study of the Baldock Rest Area and Homeless Encampments on Public Right-of-Way: A Planning and Best Practices Guide. The Research Brief associated with this report can be found at: http://archives.pdx.edu/ds/psu/17017. 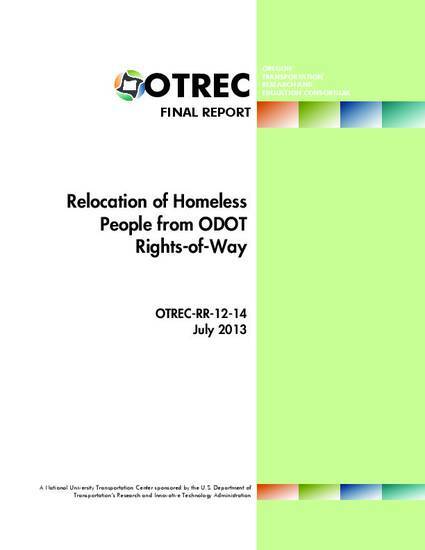 This is a final report, OTREC-RR-12-14, from the NITC program of TREC at Portland State University, and can be found online at: http://nitc.trec.pdx.edu/research/project/477. Supplemental fIles below include: Homeless Encampments on Public Right-of-Way: A Planning and Best Practices Guide and A Case Study of the Baldock Restoration Project.